Sizes: 15", 17.5", 20", 22.5"
Had $70 tune-up at a local Trek store in Boynton Beach FL in 2018 a few months ago, since the gears locked. I hate the headset, handlebars, seat and the wheels were not strong, but okay. I replaced everything else and changed it over to a 2 x 10. I love the frame and that is why I kept it. 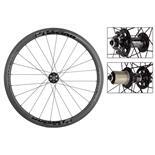 Bontrager wheels won't carry any loads. Replaced both. I've ridden my 7700 about 8,000 miles. Everything about this bike is first class except the Bontrager rims. I replaced the rear rim under warranty after about 2 years. Since then I've replaced the rear rim again. Both times the rim had cracks where the spokes attach. I would not trade this bike. I don't think there is a hybrid on the market today that can match it. I hope to ride it for thousands of miles to come. Study frame, high-quality components (1998 model) and very comfortable. Light,stable,economical when you figure the amount of comfortable miles I have on it.Lots of XT components-tricked out nicely for the price of bike.7700 good for serious old man rider like me. Comfy, but business like. Wheels have not needed truing in 5 years. Good commuter bike-light and able to handle Maine back roads that suffer from cold winters. Very stable, and fairly impervious to flats. Good century bike.Very good on gas(sorry Mid-East)Must after purchase,lose the suspension seatpost-Yes you hit bumps, but every time you pedal that baby squishes up and down-even if just a little-it wore on my knees after hundreds of miles.Also for a 17.5" bike-crankarms 175. Changed to LX 170's- much better.I'm 5'8". Frame fine fit, cranks too long. Make dealer change when you purchase. Also have C'dale H600, I feel equally as good as 7700,components not as nice, but rides almost better than Trek. C'dale has studded winter tires-700c-remarkable on ice. Never gone down-really stable on black ice, famous in Maine. The Bontrager SPA fork. It completely ruins the bicycle experience. I would give this bike 5 stars for price and quality, unfortunately this bike really only ends up being spare parts. I actually have the 2008 model, really wish I had gotten the 2007. This bike is absolutely awesome as far as weight and drivetrain. Sometimes the shifting is so smooth I really don't feel as if I have shifted at all. The new Shimano LX Front shifter has a two way down shift which can cause problems while trying to shift up gear you often hit the other shifter thus jamming it. The Tires run through gravel and dirt on the side of the road excellently. All but one of the small flaws in the bike can be fixed except the front fork shock is terribly under tensioned causing the shock to collapse to about 10mm travel instead of 35mm. This causes the shock to bottom out on even small shocks when set to max tension. Due to the bottom of the boot not being connected in anyway and the impact it takes on almost all bumps the boot will rise up anytime your full weight is not on the bike causing dirt and grime to get in and destroy the shock piston. Trek refused to admit to these problems and gave quick fixes such as to glue the boot to the bottom which didn't work due to the bottom getting slammed over and over again. This bike may work for someone of about 140lbs maybe less with the shock set at max tension. I would not reccomend it to anyone though really. Its just too much money for such a primary equipment flaw. I'd highly reccomend the Cannondale Bad Boy Ultra over this. The Bad Boys more expensive, with some lower end parts, but atleast it can be upgraded. 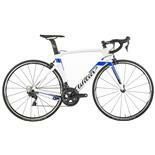 Thats my new bike as soon as I can get a refund or credit for this bike. I really don't think I could even sell this bike in good conscience. Raleigh C40, which cost 700 less and was a better bike, just due to the front shock being useful. This bike gives great handling over bad pavement and trails . The shifters and brakes are more than adequate for the job. None that I have found over many hundreds of miles . Smooth riding , excellent handling , very responsive !! The quality of the components is first rate , never any trouble at all . My dealer takes excellent care of me . 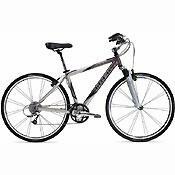 Trek mountain bikes , Trek pilot 5.0 .